To be successful in the role of a Strategic Market Manager, access to data is everything. Without the proper data, you can be operational, but not strategic. Your company’s CRM system plays a key role in organizing and optimizing your data for strategic use. Recently, I sat down with Kurt Gilmore, a Strategic Market Manager at Crowe LLP, to find out what a day in his life looks like, the kind of data he relies on, and how he measures success. Ryan: What does a day in your life as a Strategic Market Manager at Crowe look like; what are you focused on? Kurt: I think that the best way to characterize my role for the organization is as something like an orchestra conductor in the sense that I am coordinating a whole bunch of different individuals within the firm that are responsible for different components of our business. I pull various pieces of information together into a plan and then build a go-to-market strategy and then coordinate resources that ultimately builds pipelines, strengthens brand, supports new product development efforts, and ultimately drives revenue. Because you're dealing with so many different moving parts. How do you meet the challenge of working within an industry specialization? How do you shift gears? Kurt: Experience is key because wisdom gained allows me to incorporate past learnings. But then also there's just some natural learning. For example, I recently picked up construction and retail dealership verticals as internal clients. I don't know a lot about the macroeconomics of those industry sectors, so I've had to do my homework. I've learned as swiftly as I can about the general marketplace so that I can start to feed in my recommendations for strategy and campaigns, even down to the tactical level. What other industries do you work with? Kurt: I have a wide view of the firm with the various roles that I'm responsible for. I have three different verticals in the public sector. Government, Not-for-Profit, and Higher Education. They are all different, but they have shared characteristics and they are all tax-exempt organizations. Then there is Construction and R&D. What I find that's really interesting is that both of those sectors are what I consider more traditional industries in the sense that the decision-makers are not as focused on how to use technology to improve their organizations. So, they are a bit less receptive to some of the strategies that we put in place to market products like Crowe BenefitsBridge or Crowe EditAble CRM Grid for Microsoft Dynamics 365. It is interesting. I'm constantly learning and I'm also constantly applying past learnings and cross-pollinating. Historically, marketing has had somewhat of a distant relationship with CRM because it has been primarily sales-focused. But as systems evolve, both from a technology standpoint and internally, marketing is able to reap a lot of the benefits from CRM systems. As a Strategic Market Manager, how do you leverage your internal CRM system? Kurt: Crowe utilizes Microsoft Dynamics 365 as our CRM system. I turn to our CRM system for a number of reasons. Obviously, I'm looking at data constantly. First, I want to know who we have in our CRM system that fits a certain market segment. Say we decide to focus on a particular industry or a particular size of company. Then I want to see what information we have on those companies in our CRM system. Are they prospects for the firm? Are they a current client or a past client? What marketing campaigns have they received from Crowe? Then, more specifically, when I am launching a campaign I will use the data we have in Microsoft Dynamics 365 to build the campaigns, track behavior, and determine results. Can you give me an example of how you use the data in Microsoft Dynamics 365? Kurt: For example, going to market with the BenefitsBridge, our Microsoft Dynamics 365 tool for the insurance industry. Say we pick 100 strategic targets in the market and we put together some kind of integrated campaign for brand-building and product line development. Something that is a little bit nurture-based. I am going to have a campaign built within Microsoft Dynamics 365, then I can track the results on every touch. For example, did we get click-through from a specific outbound marketing communication from Company A, B, C? If I see they clicked, then they went to the page that we wanted them to go to, what did they do next? Did they watch the video, or did they click for more information? It helps me to look at those metrics because we have benchmarks for every type of activity. If we are hitting or exceeding those numbers, then it is a successful vehicle. Then, obviously we have things that maybe don't hit the mark as well, and being able to look at the metrics around a campaign or at a particular tactic within a campaign can allow me to reset and think through why Piece A was successful whereas Piece B was not. We can do some beta testing on different marketing concepts. We ultimately then tie it back to the entity of that campaign and we see if it became a sales opportunity, if it made it into the pipeline, and if it was converted into a win. Then we can start looking at the dollar amount that we're influencing in the pipeline. Do you feel that Microsoft Dynamics 365 helps you tie the marketing efforts directly back to revenue? Kurt: Yes, there is a direct dollar measurement that we can make if we have the right data inputs and we have the right tracking in place. We can say this marketing activity or this holistic marketing strategy drove a million dollars into the pipeline and the conversion rate was 50%, resulting in this much money for the firm. What Microsoft Dynamics 365 allows us to do is to be able to catch a critical data point to help us in those areas where we can tie it back to marketing. We know we touched this person 10 times and they ended up converting to a win. We can look at what campaigns they were included in or if they dropped into the sales funnel at some point, but never converted. We can learn from that. When it comes to marketing to existing customers, are you also able to leverage the Microsoft Dynamics 365 system? At a company like Crowe, where we have multiple business units, how do you make sure you are marketing the right opportunities to our existing customers? Kurt: Really, I find that the greatest strength and the greatest weakness of CRM is centered upon the user base. Crowe is a global organization. We have many folks using the system, many folks inputting data. Some of those individuals completely get it and understand that in order to unleash the power of Microsoft Dynamics 365 we need to make sure that good data and good information and good insights are going into the records. Some of the soft elements of capture such as, what software do they use and what opportunities are there to cross sell within the organization, that is all really driven by the end user and the owner of the records. Since Crowe is such a large organization, how do you keep information standardized? For example, one team calls it an “attorney” the other a “lawyer” but with that discrepancy, you cannot pull information in a uniform way. Who is responsible for that as it relates to CRM? Kurt: The success of the CRM system really depends on the tightness of record keeping, and that is a shared responsibility. We have a team within marketing that serves as data stewards. They assist with data research, standardization and completeness. They are responsible for tracking changes in records, making sure those changes are correct, and keeping the integrity of the CRM data high. Our data stewards are integral to our Microsoft Dynamics 365 adoption. If the users trust in the data, they will be more apt to use it and leverage it. So as a Strategic Market Manager is it fair to say that you feel pretty strongly about good data being the key to your success? Kurt: Absolutely. I guess I'm greedy when it comes to data because I want it all. As a strategist, I rely on good data so that I can see the insights. Strong data allows me to read the tea leaves so that I can build effective strategies. It is the cornerstone. A successful strategy really starts with the questions, what is your dataset and what is the integrity of that data? I rely on Microsoft Dynamics 365 to build my sales and marketing strategy. Thank you, Kurt, for these real world insights. If you are interested in discussing how your company can use Microsoft Dynamics 365 as a strategic tool, contact us today. 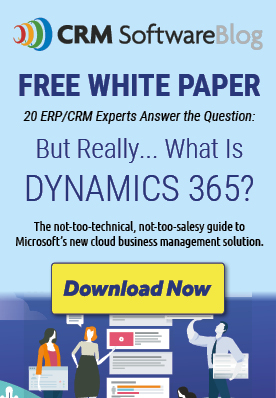 Looking to Have Multiple CRM Instances; Why Not Try Dynamics CRM?